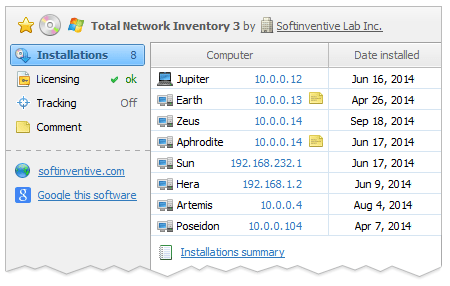 We’re delighted to announce that Total Network Inventory 3 is available today. 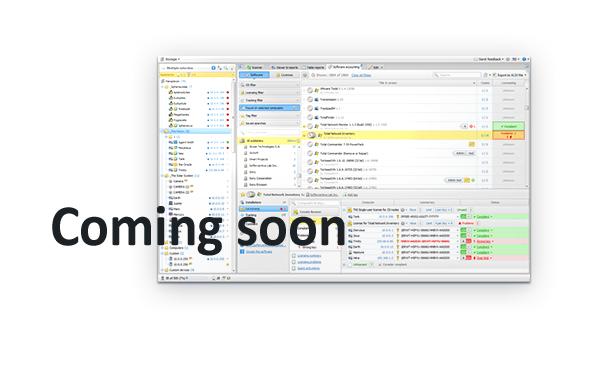 TNI 3 is a major update we’ve been working on for quite some time. It’s packed with great stuff. BIG FEATURESoftware Asset Management module. BIG FEATURENew hardware scanning technology: collected data is now far more detailed and more accurate. You may have heard a word or two from us about this one. We’ve brought the Software accounting feature in TNI to the whole new level. You won’t find anything like this in other products, and we’re extremely proud of it. Discovering software in your network is now easier than ever. Browsing computers that have an application installed is simple and straightforward. Finding programs, managing them, assigning tags and stars, filtering by various criteria, building reports, etc. — everything is intuitive, fast and accurate. And if your license includes the advanced SAM features, you get one of the most flexible License managers out there for storing crucial data on each of the licenses you own, their license keys and models. And sure enough, automatic calculation of your licensing status per software, per license or per individual installation. You can read more about it on our updated site or find getting started instructions on our user manual page. NewNew section in Peripheral devices – USB devices (manufacturer, serial number, USB version supported and current speed, driver manufacturer, version and date). ImprovedMore information on storage devices (HDD: interface type, device type – HDD or SSD, serial number, firmware revision, rotation rate, form-factor, buffer size, NCQ/TRIM/SMART support, SMART data; CD/DVD-drives: serial number, type, revision, firmware date, read and write support). Please take a minute to familiarize yourself with our new policy. TNI 3 Standard license gets cheaper. It includes all scanning and reporting features from TNI 2. It also includes part of the features of the new Software Asset Management unit. 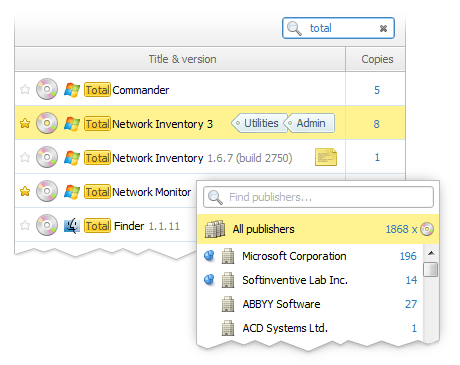 Namely: software browser and manager, installations viewer, software merging, software tracking and corresponding reports. It does not include license managing features. To get advanced Software Asset Management features (license manager, license status calculation and detailed licensing reports), you need second tier license. We call it TNI 3 Professional. It costs additional 50% of the original price (depending on the number of nodes). When you purchase your license you get 1 year of free updates. In a year you can renew your license to keep receiving updates. It will cost 20% of the price of your original license. Extending your update period is optional and is not subscription-based. Just a hint: As you can find by scrolling through our blog, a year of updates adds a lot of value to the product. Support remains free and perpetual (not connected to the limited update period). And now a few points regarding our current customers. We are grateful to all TNI 3 beta testers who provided feedback. This feedback was invaluable to us. Therefore you get TNI 3 Professional license for free. Drop us a letter to claim your license. All our customers who own TNI 2 get TNI 3 Standard license for free (your TNI 2 license will continue working with TNI 3). Customers who purchased TNI 2 before March 3, 2013 will get free updates until 3.0.1. All further updates (3.1 and higher) will require a renewal of the license. Customers who purchased TNI 2 between March 3, 2013 and March 3, 2014 will get free updates until March 3, 2015. All our customers who own TNI 2 get 50% discount for TNI 3 Professional license (this offer is valid until the release of TNI 3.1). That about covers it. If you have any questions feel free to ask on our support page. Download TNI 3 and enjoy all the great new features it has to offer. During the trial period you will be able to evaluate all features of the full TNI 3 Professional package. Don’t forget to use the Feedback button. Your feedback made this update possible, so keep it coming and let’s see what’s next! And so is the long-awaited release. We have the new and final date to announce. Get TNI 2 now with a 25% discount. When TNI 3 is out, all our customers get it for free. Get the new SAM with a 50% discount. Full year of free updates. There, now you have another good reason to wait for spring. Have a nice what’s-left-of-this-winter and we’ll see you in March! Greetings! Today we have an announcement to make. This December February we’ll be releasing TNI 3, a major update featuring the new Software Asset Management (SAM) system that some of you have had the chance to use (and we’re getting a lot of positive feedback, too!). This means superb support and regular new features. Just scroll through this blog to see what a year of updates is worth when we do it! A few things went wrong here, and then another few. The release is postponed, and right now we’re doing our best to make the delay as brief as possible.